Feb 18 Bad Service, Street Food- Whatever, Bring it on. Feed Me! This weather is seriously getting ridonkulous. It's 9 degrees Celsius which is a little over 33 Fahrenheit. I'm wearing 2 pairs of pants, socks, a scarf, 3 shirts, & a huge jackets, with boots while my friends back home are tanning at the beach in their bikinis. Did I mention I hold a heating pad in my hands at all times? I'm an actual valley girl, you know like in the movie Clueless & anything weather under 70 does not float my boat. Sigh... Well despite the wind, rain, & full on crapalicious weather Lunar New Year celebrations were still in full swing. 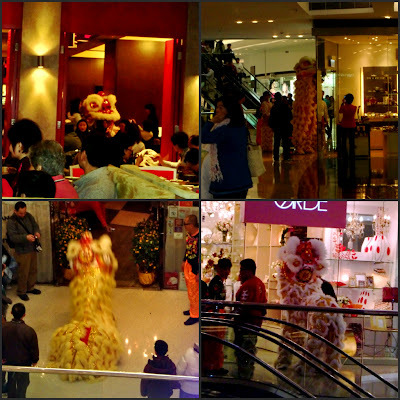 Above is a picture of lion dancers going to stores in the mall trying to get some moolah in red envelopes, praying on people that want to start off the new year right to give them a few bucks. Genius! Inspires me to put on a lion outfit and prance around for money... maybe next year. Here's a recap for the past 2 days. I did a lot of reeating at places that I like so if I already posted on those foods before I'll just link to my previous post instead of reposting pictures to bore you. Place 1:北京水餃皇: I don't think they had an English name. This was a random place we ventured into in Wan Chai. Worst service ever! Seriously! We ordered our meal and then the waitress comes out lady and says the chef left so we can't make 2 of the 3 things you ordered. Uh, ok? So we chose another dish. Oh wait, we can't make that either! Then I just turned and asked them what can you make? Anyways, though I'll never recommend this place at least it's a good lesson on different types of Chinese food. This was a Beijing/Shanghainese place. However, the shanghainese dishes I ordered were too hard to make so let's just consider this a Beijing restaurant. 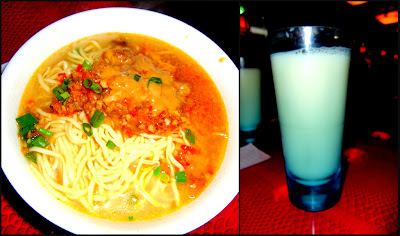 Left is "dam dam mian" The soup base is spicy but the noddles are a little thicker than "la mian/ramen" and a little more soft. Right is a picture of soy milk. I like mine hot and sweet. At least they did something right! Here was their breakout dish that- surprise! they were able to make. 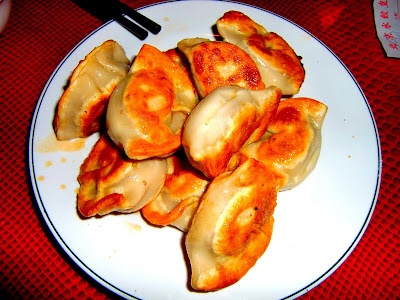 It's panfried lamb dumplings. I love lamb. Some people don't like the taste cause it has a very distinctive taste to it. It's definitely an acquired taste! Place 2: Han Fa Lau in Causeway Bay is a repeat from before. They actually have decent snack food but I only go here for their desserts. 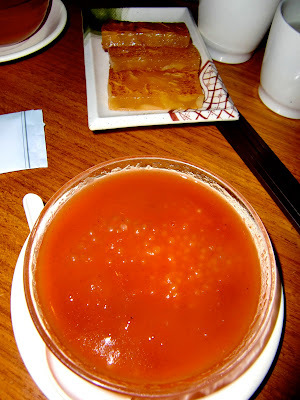 The redish color soup in front is Hawthorne soup with sago. Look at my previous post on it for more info. The yellow cake-like dish in the back is panfried water chestnut cake. These are the new dishes we tried in addition to our usual that we get here. Left is a veggie dumpling. Middle is a sharks fin soup dumpling with fish stomach. Sounds gross but its delicious. Also if you are back in L.A., just go to a nicer dim sum restaurant and you can find sharks fin dumpling soup. It's super good. Left is our dessert of fried milk. Honorable mention for their amazing sesame eggplant, which we also had. You can see it in my previous post as well. We'll definitely be back before we leave since we didn't get to have baby piglet. Such a disappointment. We transfered 3 different subway lines to get there! Boo! It's ok, the eggplant itself is worth it! This is also from the side of the street. I guess it's technically considered a restaurant in that they have plastic chairs and a table but that's about it. You can find this anywhere. 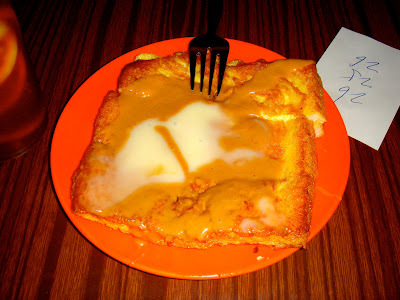 This is peanut butter toast with condensed milk. Ah! Lovely! It's worth a clogged artery or two. 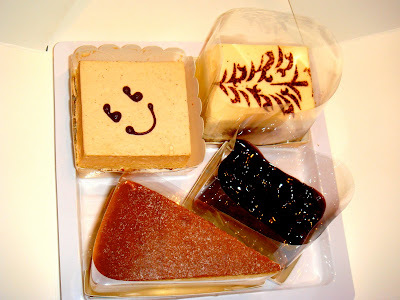 And to finish today's post off, here's a picture of cakes from Zoe's. It's actually an old picture from the last time I was here which was I guess less than a month ago. I don't love them or hate them. I just think they are overhyped. 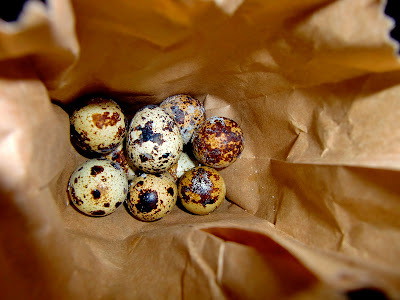 I first learned about them in a magazine review. I'd rather have me some 85C or JJ's Bakery back in L.A.! Happy Eatings and enjoy your perfect weather! I'm jealous! Feb 19 Waking Up Is Hard To Do! Feb 16 Crappy Weather But Good Food Makes Up For It!